TORONTO, ON--(Marketwired - July 19, 2016) - For every kid during the 1980s, and for fans of the films of the decade, Netflix's new series Stranger Things will feel very familiar and reminiscent of the thrills of Steven Spielberg's earlier works. The Out-of-Home campaign, with media managed by PATTISON Outdoor and production designed by its in-house agency Fourth Wall, pays homage to the retro series with a promotional campaign running until the first week of August at select Toronto TTC stations. 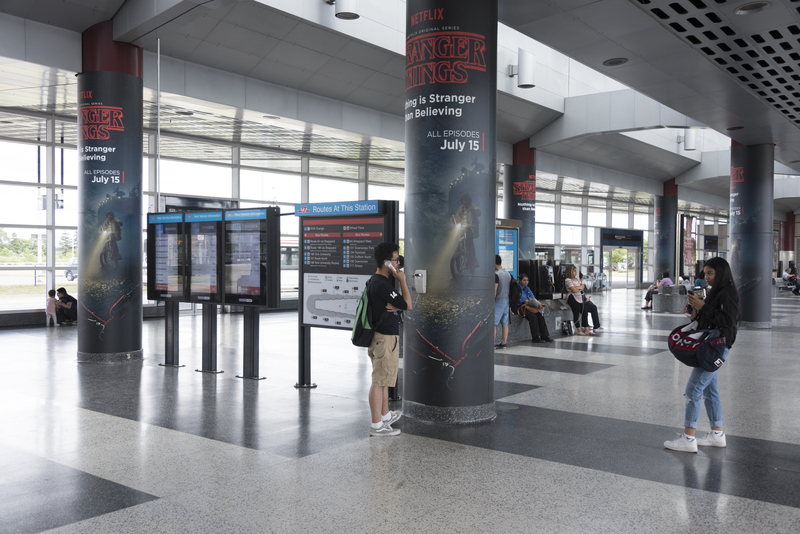 TTC stations include Don Mills, Downsview, Bay, Spadina and Finch stations, and each location includes custom-fitted "Stranger Phones" mounted to Pillar Wraps promoting the Netflix series. The telephones will ring every three minutes, and when a passerby picks up the receiver, a frightening message pertaining to the show is delivered. "A telephone similar to the ones shown in Stranger Things and what many grew up with in the 1980s might seem very basic and pedestrian, but actually required a lot of current technology to get them operational on a Pillar Wrap in a short period of time," said Dmitri Melamed, VP of Production for Fourth Wall Media. "Like any project we work on, the challenges were extremely inviting. Getting these custom-built telephones up-and-running quickly to meet the needs of the campaign and to ensure these industrial grade receivers could communicate properly with our computers and without direct power for extended periods of time was paramount. Stranger Things extends beyond the bounds as a tribute to films of the 80s, so our execution needed to fit the theme." Set in the 1980s, Stranger Things, a Spielbergian-style series evoking the vibe of movies of that decade, centers on the disappearance of a young boy under some very mysterious circumstances and a girl who possesses superhuman abilities. More information can be found at twitter.com/Netflix_CA. 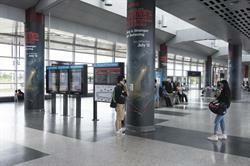 PATTISON Outdoor Advertising, a division of The Jim Pattison Group, is Canada's largest Out-of-Home advertising company. With its roots reaching back to 1908, PATTISON has been providing innovative solutions for Out-of-Home advertising opportunities with products ranging from traditional billboards and posters to transit, digital, airports, mall, residential, office, and street furniture. PATTISON also offers Canada's largest portfolio of Digital Out-of-Home (DOOH) advertising properties, through PATTISON Onestop, a world-leader in the design, operation, and advancement of digital advertising networks for the office, transportation, sports retail, and residential environments, and with its experiential/interactive development arm at Fourth Wall. PATTISON is headquartered in Toronto Ontario and includes over 25 sales offices across the country providing advertisers unmatched reach and coverage with products available in nearly 200 markets coast to coast. Netflix's new show Stranger Things is a homage to 1980s thrillers, and the Out-of-Home campaign at TTC stations across Toronto uses old technology to entice viewers.